We came across Tigges Imbiss by pure chance. Riding along whilst discussing our desire to enter a cheap, typically German, fast food restaurant, we saw a huge motorcycle sign. It would seem that this place is the equivalent to a biker cafe in England. It may not be the most extravagant place, but it is clean and there is plenty of space on the tables to lay out your gear and things. The menu is found on a huge board, which you have to decipher for yourself. The lady on the counter and the cook don’t speak a word of English and there are no translations to be found. Having said that, HUGE portions of tasty food appeared. Most of the dishes are fried though and meat based. It was hard to choose from all their dishes, but we went for schnitzel with chips. I think the total cost of the meal came to around £15 for the two of us, with drinks. Other options included burgers, hotdogs and adaptations on the traditional schnitzel. Overall, for the price of the food, we were very impressed. The food arrived quickly, was tasty and certainly filled us up! There is also ample motorcycle parking outside. 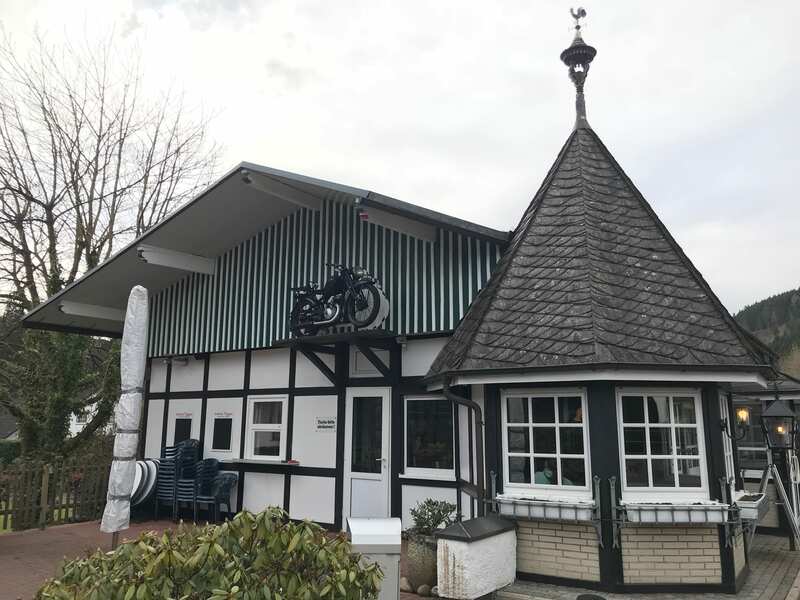 For bikers in Germany, needing a break and some lunch, this place is ideal.